What's going on at McDougle! We've received an assortment of high-interest low-level books, and Carolyn has been so kind as to label them for us so they're easy to find in the library. You can get a list of all these titles by going to the online catalog available from the library's website, clicking on Resources lists (left hand side), choose the "Public lists" from the tabs and scroll down to "MMS: Striving Readers." Why does this matter to people other than English teachers? Well...quite a few of the books are nonfiction, and have some really excellent information on scientific and historical topics. If you want some engaging content-area reading for your striving readers, let me or Carolyn know and we'll be more than happy to point you in the right direction! Okay, so, it's that time of year. Testing. We all saw the John Oliver video, and we all know that when it comes to testing, the struggle is real. But it doesn't have to be awful! The next few weeks can be full of learning and...wait for it...actual engagement in the classroom. This month's edition of Literacy for All includes tools you can use to keep up the energy as we push toward the end of the year! I've talked about Kahoot before, but if you want to try it and are a little nervous about how it will go, don't stress. I would be more than happy to co-teach a Kahoot lesson with you! 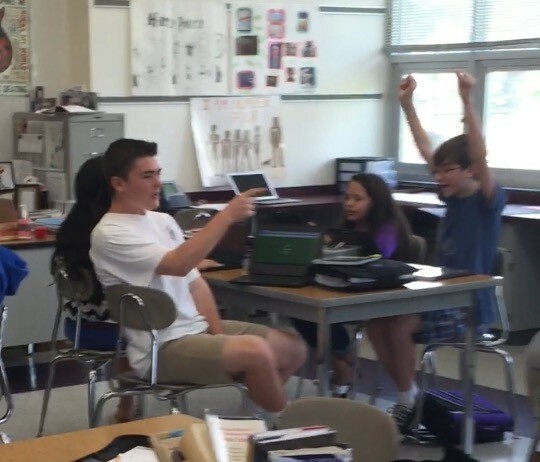 In short, Kahoot is a digital multiple choice review game that you create yourself with your own content. Kids use computers, phones or tablets to play. Jennifer Spaeth and I got to get our Kahoot on earlier today, and the kids had a blast (see their unbridled joy below!). I haven't gotten to try it yet, but PearDeck lets you present your slides to kids, while the kids get to interact with them on their laptops. Looks pretty SWEET! Check out the vid below! How does Pear Deck Work? What2Learn is a cool website where you can make your own games for students to play for review. Plenty of pre-made games as well! The fantastic Richard Byrne has an excellent comparative chart about sites for making your own quizzes. He's vetted them all himself! Once the test is done, what can you do? In last month's edition of Literacy for All, we talked about digital portfolios for kids to reflect on their learning. This month, I've got some new resources for you to check out. Podcasts are gaining a great deal of traction in the education world, both in having students listen to them, but also in having students create their own. Consider letting your kiddos create a podcast to demonstrate all of the knowledge they've gained over the course of the year. Check out SoundCloud for Podcasting as a great tool to use. FutureMe allows you to send an email to yourself...in the future! How about having kids write a letter to themselves for the beginning of the year? Or what about having kids write letters to their future teachers? Imagine if, in the first week of school, you received an email about each of your students' learning styles and attitudes about school; that would certainly save a lot of info-collecting at the beginning of the year. The time after exams is a great time to try out the ideas you've been thinking about all year. One awesome, fun, and engaging pedagogical method is flipclass. Want to learn more? Go get FlipClass Certified at Sophia.org. I took the course myself and found it easy, short, and honestly very informative. If you're an old-hand at flipping, check out Vialogues, a new site for hosting your videos.